Set in well tended gardens, the Georgia Studios and Apartments offer comfortable accommodation in a friendly and relaxed atmosphere ideal for families and couples alike. The Georgia has it\'s own swimming pool with sunny terraces. Self Catering though u could have a good English Breakfast for 6 euro, I didn't take it but the people that did said it was worth it. Food could be purchased from Breakfast time until 11.30 and Billy the owner would also have the BBQ going every night from 7.30. A supermarket next door had most things that you would need but I recommend that you take your own coffee/teabags as they are rather expensive. Sugar/Milk is cheap. If you go out the back of the hotel turn left and walk about 5 mins up the road you will come upon a beautiful bakery called "Sweet Dreams" the food is out of this world and not expensive. The bakery is open from 6 every morning. Cans of pop in the hotel are expensive at 2 euro per can considering the same ones are 70cents next door in the shop. You can purchase 6 large bottles of water from the hotel for 2.50 euro but this is for room only use and not to be taken beside the pool. Small bottles of water that are sold in the hotel are 60cents each. All you need to do is keep the small bottles and refill from the large. The hotel is very clean and Billy loves his gardens with all of the fruit trees. The cleaners come on a Saturday, Monday and Wednesday so take a fan if you want to save 10 euro per night on air con and put the fan into your luggage bag when the cleaner is due. There are safety deposit boxes in every room and its only 20 euro for the fortnight. All of the hotels family were friendly and polite without being over the top. There is a games room for the kids with internet, pool table, air hockey table, arcade game and even a massage chair. The swimming pool in lovely and clean and it is only 1.5 metres at its main depth. There are plenty of sunbeds and rather than umberellas there is a canopy all around the outside sunbeds which is great for the sun as u can pull you bed in and out as you want. You must do the Greek night at the hotel its only 10 euro per adult and about 7 per child including food. Its a great night and everyone joins in together dancing on tables, around the pool etc. They also hold a weekly Karaoke night if you are into that type of thing. The location of the hotel is not so good as you do need to walk to the village for a taverna and more shops. Take the easy option leave at 7.30 pm when it isn't as hot take a slow stroll up (fun fair at top) and if you want get a taxi back down its only 5 euro for a taxi. If you dont want to walk up the hotel will get you a taxi but for some reason the taxi drivers charge more this way. You can also get a bus from outside the back of the hotel to all over the island. We went to Falraki early evening (doesnt liven up til about 11pm) and the bus was only 1.40 euro per adult. A taxi back was only 9 euro so not bad going really. If you come out of the front hotel and turn right walk along the road for about ten mins and cross over you will see a sign saying Golf ? walk down that road and you will come to the beach. The beach is huge and really clean. Plently of sunbeds but not loads of people. There is some sand but all of the sunbeds are on the shingle and there is also alot of shingle in the sea. The sea is nice and warm but I advise you take water shoes or something rather than flip flops and you will have a nice time. There only seems to be one small shop/cafe on this area of the beach so dont go expecting to have a night out down there. Its reasonable priced though. You can also get to the beach by going up into the village and going by mini train down to the beach. Not sure of the price as we never used it. Be careful of the traffic in the village it can be a little crazy at first. Remember this is a working village and not really a resort. When you walk up to the village there is a strip of pubs to your left take your pick but you must go and see Terry his is the one with the large tv screen. You can sit in here have a drink nip to the Gyros or pizza shop and bring your food back and eat while drinking its no problem. If you want a real meal follow the same road down and around to your left and head for the Four Seasons the food is outstanding and the place is immaculate and very popular. The food is not expenisive either infact it was so reasonable we had to check and make sure they had charged for the drinks! If this hotel could be picked up and moved a little closer to the village or if even a few tavernas were around it I would go back for sure. All in all we had a lovely relaxing time and met lots of nice people. The Place Is in the middle of No-Were ! Main Road out side , track to Walk Along Side - need Walking Boots . It's 30 min walk to the Very Big Pebbley Beach . Boots needed " Ear " to . Village again 25 mins walk , with NO Bars or Taverna's for a Drink . Afandu is OK .... But most Bars Closed in After-noon .... What .... Yes Closed . Studio ... Large , big Balcony .... Shower Tray very very Small & slippy Be Very Care-ful in There . Did not Do Greek & BBQ ....so we were not very Welome ...... I asked for Bloody Mary & told Twice ... sorry No Tomato-Juice .... What it's July & Super Market next ( i bought it myself ). We did go t beach 4 times & Afandu each Night , We made the most of a Cheap Holiday . you get What you pay for. The place is for Returning Guess & THE Greeks Themselfs. Very Noisey at Night ( 2:30am ) most nights ..... With the GREEKS . Now it's 40c & they want .... 10 Euro a Day ...... you can Buy a Fan in Afandu For 20 Euro But they will Take it Out of your Room . No i would not Recmend this Place at All .... All they want is Your money thats it . Georgia apartments were excellent the studio rooms were basic but your only in them to sleep so no problem there. The staff without exception were really nice always friendly and helpful. The meals we had there were great all meats are cooked on bbq mmmm tasty. The Greek night was great fun they had us all dancing round the pool. The pool area was smashing you could always get a bed to lay on they were comfy for a change as well. The apartments are in a good location for getting around Rhodes as the bus stop either way is just out the front.The only thing I can say could be better is the cleaners come very early and if your still in bed will just come in they then leave on seeing you but dont always come back thereby leaving your toilet bin unemptied .Which going 5 days or so is not nice. we stayed at this hotel sept 08 the hotel was exceptionatly clean at all times,linen and towels were changed every other day, the staff were the friendliest and most helpful that we have ever encountered, the pool was really nice with sun loungers all round and shady areas which was refreshing. The food was fantastic and all cooked fresh plenty of choice even for the fussiest of eaters. The entertainment included Greek night (very funny) and karaoke and a danish singer and bingo , all top sporting events were shown on big tv. The rooms were basic but very clean and had everything you need. Stayed first two weeks in June.Apartment on first floor overlooking the pool had a two bed apartment.Could not fault it bedding changed every other day and towels.Very friendly. I had booked this apartment to be near the golf course which it was. Only fault the walk to the beach is a good 15 mins away.Also if you like a bar on the beach it took us 50 mins to walk and there are only two bars on the whole beach.Very quiet and beautiful .The village is also very nice and very friendly and just a short walk away.Taxis I found to be very expensive but bus service brilliant and very friendly bus drivers.Falariki just next door to Afandou and nice sandy beach.The Golf Resteraunt execellent! The lamb in filo pastry wow what can I say.Beware of the main road very busy.Next to our apartments brill supermarket cheap as Asda with lovely freashly baked rolls.Only small supermarket but sold most things.Great place to stay just be prepared to walk to the beach.Also pool fab and bar around really nice. We stayed at the Georgia in Afandou and its the best holiday we have ever had sure the rooms are small in the older building but i defy anyone to show us better 3 star rooms/apartments than those poolside , the location is a bit out of the way but if you walk out of the back of the hotel turn left it is a 10 minuite walk to afandou with a lovely greek church along the way that you can go into and take a look . 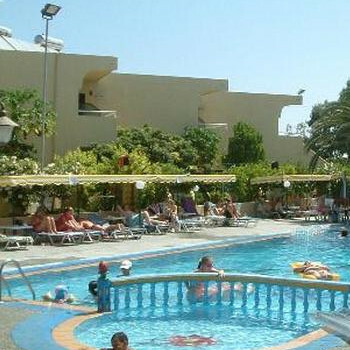 The Staff were all friendly at the hotel and the other guest were warm and friendly we made many friends the pool is great the bar is cheap and the food is good, the entertaiment was good greek night with Crazy Billy doing the ring of fire dance , Karioake was a great night all in all a very good 3 star holiday would go back no problems . We stayed at the Georgia Apts in June 06. Looking at some some reviews they must be quite old. The apartments now have air con, albeit you pay a supplement for it, but worth every penny. It was 40+ some days! Yes, the location of the Georgia is a bit 'out of it'. The walk to Afandou village would be fine if the temp was lower, but it was a lovely traditional Greek village with the square where locals all descend every evening to chat in the pavement bars. The apartment was extremely large, 2double bedrooms, ample sized kitchen and big enough shower room. We found it to be cleaned every day were were there and towels were replenished if left on floor, so no complaints there. We tended to go to Faliraki each evening as we were visiting family and there is more variety of evening entertainment. Taxis only cost between 5 and 8 euros each way. Pool area very good and bar/restaurant reasonably priced and decent food. all in all, we found we got what we paid for. Georgia Apartments is a family run hotel and offer a great greek theme in terms of the food the famous greek nights on a Friday. The rooms are basic but clean and what you need for a holiday. The apartments are 20 minute walk from Afandou town centre with a number of shops and bars. I have been 3 times and have had a pleasent stay and made to feel very welcome and would recommend people to visit. The food was fantastic and service was of the highest standard. When we were dropped off at the Georgia, I thought I'd made a big mistake. It seemed to be in the middle of nowhere and the stairs to our apartment (which was on the top floor) were dangerously uneven and traveling alone with a child I was worried about him falling! The room was basic but fairly roomy and clean. The only thing was our room was only cleaned once in the week we stayed there and our towels changed the same. However, when I read other reports the rooms were cleaned more frequently. The hotel itself was nice enough and did have a family atmosphere. I didn't find the staff particularly friendly, but the people I met up with made up for this. As it is a fairly small hotel and pretty isolated, the people in the hotel were great - and everybody got to know practically everyone else. The kids also played together and there was a nice little park for them to play in as well as a games room which was basic but fine. The pool was lovely and cleaned every night. The food in the hotel was basic - but nice. I would recommend the Georgia chicken - a beautiful cream, bacon and mushroom sauce over heaps of chicken, rice and chips - lovely. The Greek salad is also beautiful and the prices reasonable. As before the hotel is a little isolated, but Afandou a lovely little village is about a 15 minute walk away. The road taking you there though was pretty dark and ran out of pavement in some parts but a taxi was about 5 Euros. Faliraki was also only a short distance away and this cost about 8 Euros. Unfortunately because the end of season the Greek night was cancelled but I'd heard it was a great night. On a Tuesday though there was a Karaoke/Disco night and was great fun - for adults and kids.